Middleton Hall is definitely not an island. We have actively established and now enjoy links with various individuals and groups of different ages and interests. 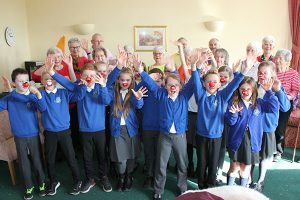 Children are always welcomed here, and residents love to see what local schoolchildren are up to. The youngsters presented a wonderful scarecrow for our scarecrow competition and have impressed us with their singing performances. Students have given a concert to showcase their talents, something we intend to be a regular occasion. It’s not Christmas until local guides and brownies treat us to their annual carol concert! It is always a full house. There is a natural affinity between our two organisations and we support each other at events throughout the year, such as at the annual open air Tea dance in Darlington market square. Representatives from MIND (the mental health charity) regularly visit to give talks and support, such as a series of workshops about Mindfulness and monthly sessions about Peer Group Support. Members from the trust are regular visitors to Middleton Hall to give talks and advise on our wildlife programmes. Thanks to these energetic volunteers, we know how to make bird and bat boxes, and are familiar with the lives of butterflies, damselflies and dragonflies. Residents are thrilled at the annual visit from the Owl Centre team – including the human, scaled and feathered varieties. A snake, barn owl, huge dragon lizards, a baby hedgehog, tortoise and a strangely charming creature called a skinny pig are all cuddled. Over the years, residents and staff at Middleton Hall have supported local charities that are both deserving and meaningful to us.